I recently received an email from Simon who had a request for me to make a puma for his wife Fleur, this is a tough challenge as its really difficult to make the face look right but I had a go at it anyway, and I took inspiration from a photograph of a puma leaping through the air. 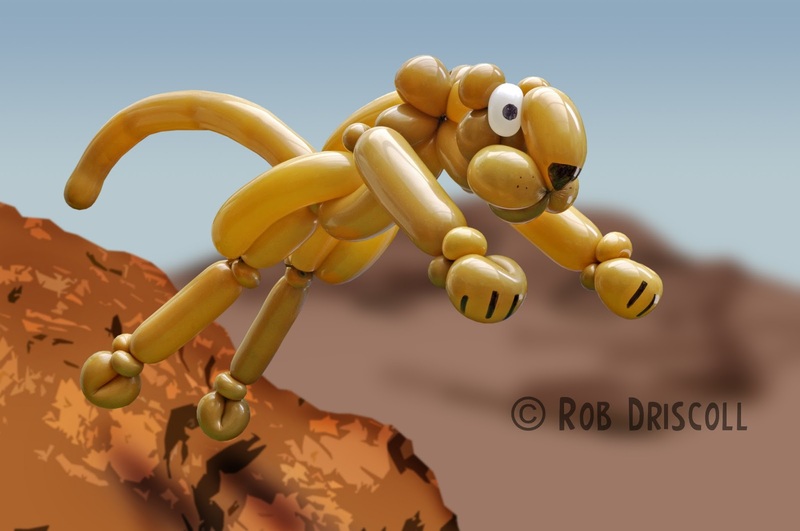 This Puma is made from 7 balloons, all of them 260s, I started with his head which was 1 balloon, then added his body and neck with another, the next balloon was his arms, then his legs are made from 2 balloons, the last things to add were his tail and finally his eyes. As I say it was quite a challenge and I will have another go as a puma in the future as I have some other ideas about the face, thanks for the request Simon, I hope Fleur liked it. Simon also requested some videos of my balloon modelling and I will be doing some of those in the near future so watch this space. On another note you will see I have started watermarking my photos as I recently found someone in the USA using my Calvin and Hobbes photo on their website.